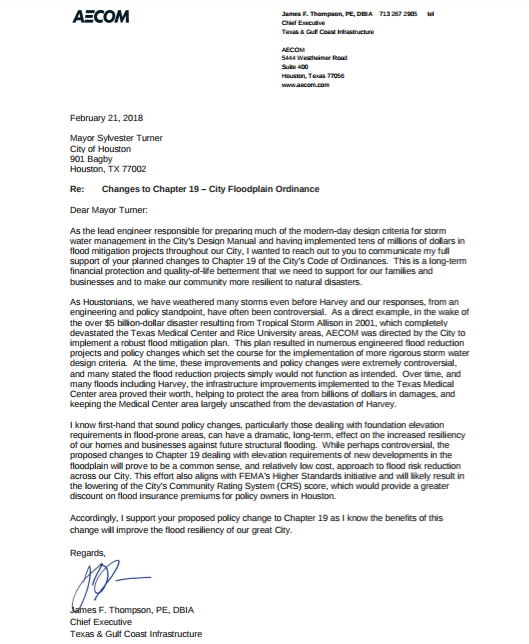 February 22, 2018 -- In a letter to Mayor Sylvester Turner, James F. Thompson, chief executive of the Texas & Gulf Coast Infrastructure division of the international engineering / development / construction firm AECOM, endorses the mayor's proposal to require that future dwellings and other buildings in flood plains be constructed higher to prevent flooding. Thompson's firm oversaw a massive flood protection project at the Texas Medical Center-Rice University area after flooding from Tropical Storm Allison in 2001 caused $5 billion in damages there. The same area had no significant flooding from Hurricane Harvey in August. "I know first-hand that sound policy changes, particularly those dealing with foundation elevation requirements in flood-prone areas, can have a dramatic, long-term effect on the increased resiliency of our homes and businesses against future structural flooding. While perhaps controversial, the proposed changes . . . dealing with elevation requirements of new developments in the floodplain will prove to be a common sense, and relatively low cost, approach to flood risk reduction across our City," Thompson wrote. A copy of his Feb. 21 letter appears below. "We must do things differently in the post-Harvey area following the epic, deadly flooding brought by that hurricane," Mayor Turner said. "I appreciate the support from James Thompson, many others in the engineering and development community, and all Houstonians as we move forward." Information about the mayor's flood ordinance proposals is at https://houstonrecovers.org/houston19/, including ways for the public to express opinions about the issue.